These days the Olympian amateur is a dead concept. The bell tolled for it once football was let in but Andy Murray’s gold medal, whilst being a highlight of the London games, hammered the last nail into the coffin. Unless you have serious sponsorship you have little chance of getting a medal. So professionals are welcomed with open arms but it was not always so, just ask Hans Baumler. Hans Jurgen Baumler was a German ice skating champion and partner of Marika Kilius. The couple won Olympic medals in 1960 and 1964 as well as championships in Germany and internationally. Their 1964 silver medal was withdrawn because they had signed a professional contract that year. Baumler had an excellent chart for a sportsman, a strong Mars being a basic requirement, his was the apex of an ultra competitive T Square including an opposition between his Sun and Pluto. His Sun is in Aquarius, the coolest sign, and a topic for future research could be to see whether this placing occurs more frequently amongst Winter Olympians. Certainly his Moon / Jupiter conjunction in Gemini would be valuable for a sport that relies so much on dexterity of movement. Whilst the Sun, Moon and Ascendant signs will show the character of the person, the major themes in a life will be generally indicated by a planet at the apex of the T Square if there is one. The T Square is a difficult aspect pattern because it is based on an opposition and two squares so there are generally some major problems to be overcome, but it’s the challenges that force the person to focus their energies on the apex planet and that is why it becomes so important in their life. Mars shows the focus is on competitive sport but its in Taurus in the 2nd house, so we are essentially dealing with money. Because Pluto is involved there will be a sudden, unexpected development. Pluto’s works like an earthquake, sweeping the ground away from under one’s feet. So Baumler was awarded the Silver medal for skating ( apex Mars ) but it was suddenly withdrawn ( square Pluto ) because he had signed a professional contract ( Mars in Taurus in the 2nd house of money ). 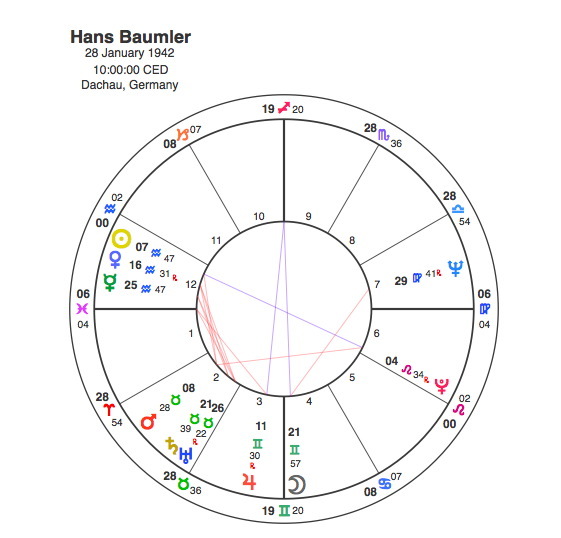 As ever Pluto’s transits trigger the important changes in someone’s life and it would come as no surprise that Baumler’s first Olympic medal was won whilst Pluto was opposite his Ascendant in 1960. After losing his medal, Baumler began appearing in a number of ice dance shows and also worked as an actor. His peak was probably in 1969 when he had a main role in the operetta, Im weißen Rössel while Pluto was square his Moon. When Pluto is in aspect to the Sun at birth, it will only make one transit if any to the Sun in a lifetime. Because Pluto moves slowly, this transit will come in later life. In 1987, at the age of 45 long after the competitive skates had been put away, Pluto moved to square the Sun and perhaps even more significantly oppose his Mars. What possible upheaval could be expected from this transit and how might an astrologer warn Baumler of what to expect ? Prediction is what everyone believes Astrology is about but Capricorn Research’s take is that its not what the subject is for. Understandably everyone wants to know what is going to happen to them, but this concern comes from a basic human weakness of not being able to live contentedly in the present. Why should the Universe support this weakness ? All the evidence from religious and other teachings is that we should ” take no thought of tomorrow ” and that we should live for the moment. Astrology’s greatest gift is that it can help us to understand both our and other people’s place in the world. It gives us an insight into what is being asked of us in this moment. Unfortunately astrologers have become sidetracked from their job of explaining this important role and persuaded by us to tell us what the future has in store. It’s understandable that astrologers have gone that way as they also wish to earn a living of some sort but the requirement of prediction takes the astrologer into uncharted territory and asks a lot about their own individual skill and intuition. Inevitably some predictions will be right and some wrong, although its fair to say that astrologers will generally prove better at predicting events than other people because they at least have some insight into the kinds of energies that will be operating at the time. Unfortunately this focus on prediction leaves astrology open to be attacked by anyone who has received a prediction that has not come to pass. So some astrologer trying to get their brain around how the symbols might specifically apply in a future event can leave the whole subject open to being dismissed. It would be interesting if Hans Baumler had gone to an astrologer in say 1980, asking what the next decade would bring for him. Any astrologer seeing his natal T square and looking at Pluto’s transit in 1987 to form a Grand Cross in square to the Sun and Pluto and opposite his Mars would be worrying how to present this development to their client. It would no doubt be couched in positive thinking terminology like its not what happens but how we respond to the difficulties in life that define us, but any astrologer would be preparing Baumler for a very difficult time with a sudden loss of something very significant. If you asked 100 astrologers to predict what would happen, its a fair bet that not one of them would say ” you know that medal you lost in 1964, you’ll get it back in 1987 ” but that is exactly what happened. They say hindsight is a wonderful thing and attempts by astrologers to explain life by this method are frequently dismissed because anyone can bend events to meet the symbols concerned. But understanding is exactly what Astrology is for. It is a wonderful tool that is always there for us as long as we don’t get hung up about the future. Pluto had moved to opposite Baumler’s Mars so the decision to withdraw his silver medal ( apex Mars ) because he had signed a professional contract ( in Taurus in the 2nd house ) was reversed ( Pluto opposition transit ) and the medal was handed back. No one could have predicted it, but that doesn’t make it any less true.